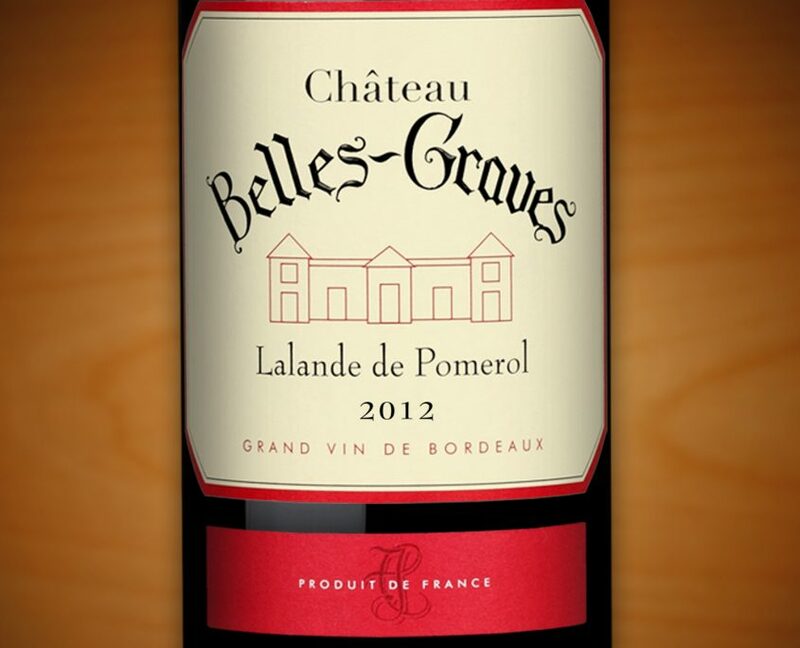 The wines produced at Château Belles-Graves are a reflection of the earth which yields them and of the landscape from which the vines grow; they combine complexity and harmony with elegance. – At each stage of the vine-cycle: the ground is worked using traditional methods (including hoeing and turning the soil) and organic fertilisers are employed as well as measured quantities of phytosanitary treatments. – At each moment of the wine-making process: the harvesting is done manually, the vendages rigorously sorted, the vinification process is carried out as gently as possible and a maturation in barrels in accordance with the oldest Bordeaux tradition is facilitated. At this point, it is not only the flavour from the wood which is sought, but the slow provision of oxygen to the wine which is allowed to permeate the sides of the casks. For this process the oak is selected for the density of its grain and fineness. From one year to the next, thanks to the dedication and care in these areas, the continuity of the earth combines with the caprices of the climate and this brings to each vintage both a reassuring continuity and something exhilarating and new. The hand of man must at all times remain nothing more than an accompaniment, in order to respect the fickle ways of mother nature. The quality of the grape at the time of the harvest depends largely on the work that man dedicates to his vine, but it is ultimately nature who remains in charge of the game, and the climate and weather play an enormous role. Between two and three weeks before the maturation of the grapes, the ripeness of the grapes is checked at the vine twice a week. This consists of removing individual grapes from each parcel of land in order to follow the evolution of 100 fruits and their sugar and acidity content. But of course, only regular tastings hold the key to discovering the flavours they express and to follow their evolution. 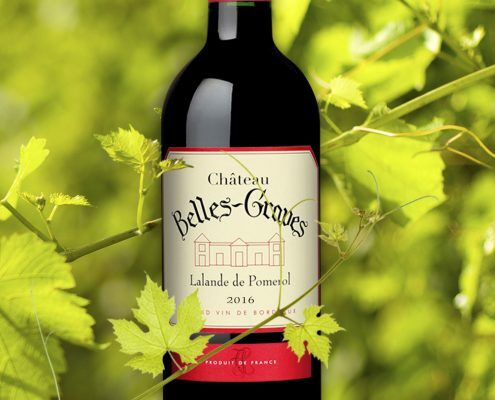 The difficulty of wine production is to adapt oneself to the raw material each year, in order to bring out, in both their diversity and subtlety, the essential characteristics of the vintage and the soil particular to Belles-Graves. When the time arrives to begin the harvest, which are still carried out manually, and where the traditional conviviality and bonhomie have not been lost, the grapes simply need to be picked and placed into baskets. 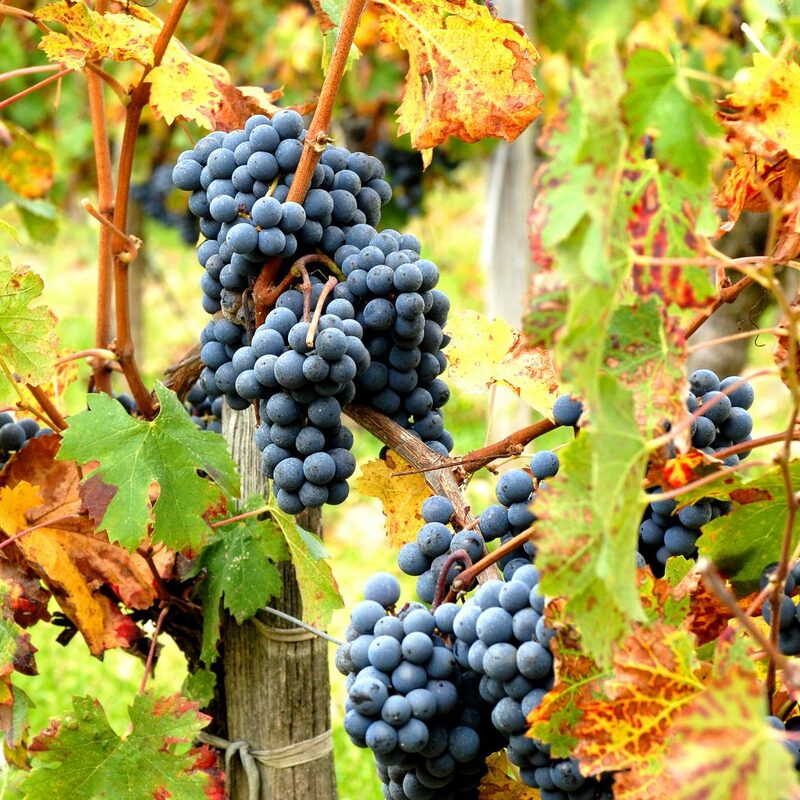 The sorting in the cellar enables the separation of grapes from leaves and petioles, and finally the grapes which are damaged or passed their best. 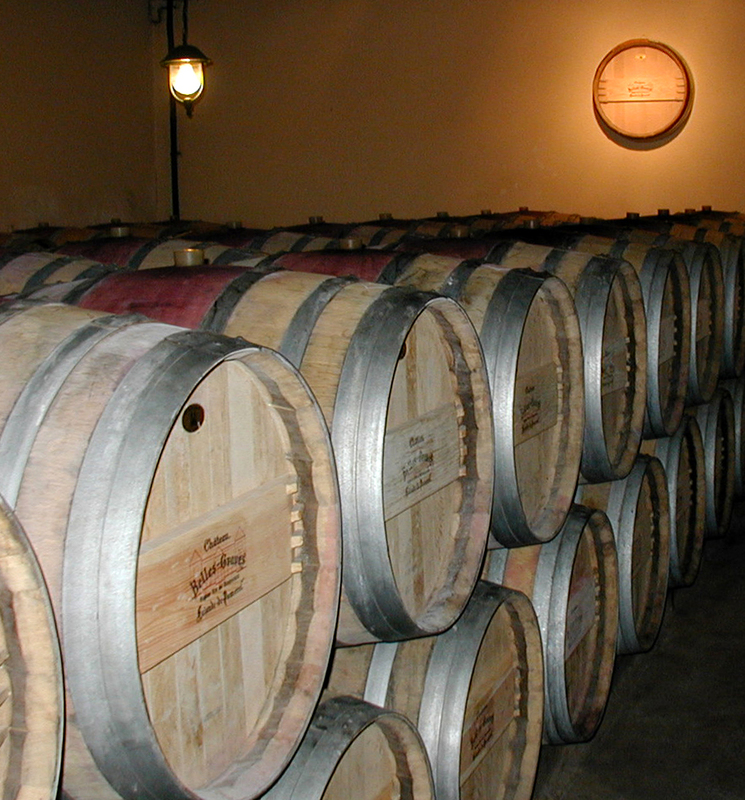 The process of maturation of the wine begins in the month of November, when the wine if put into barrels, the traditional barriques of the Bordeaux region (capacity of 225 litres). All of the wine ages inside vessels made of French oak. The batches of wine are tasted beforehand to help decide the proportion of new barrels to old ones, to balance the potential of the wine. This process concerns avoiding masking the flavour natural to the grapes from this estate by the strong flavour from the wood. The flavours of the wood and of the fruit must be in balance. All though this process, tasting is our guide, and it is through our palates that we can become best involved in the wine. Just as with the vinification process, no step is carried out robotically. The barrels furnish the wine with a very gentle micro-oxygenation which is of great benefit to it. Apart from this, the wine begins to clarify much quicker when in a smaller container, meaning there is no need to filter at the end of the maturation process. 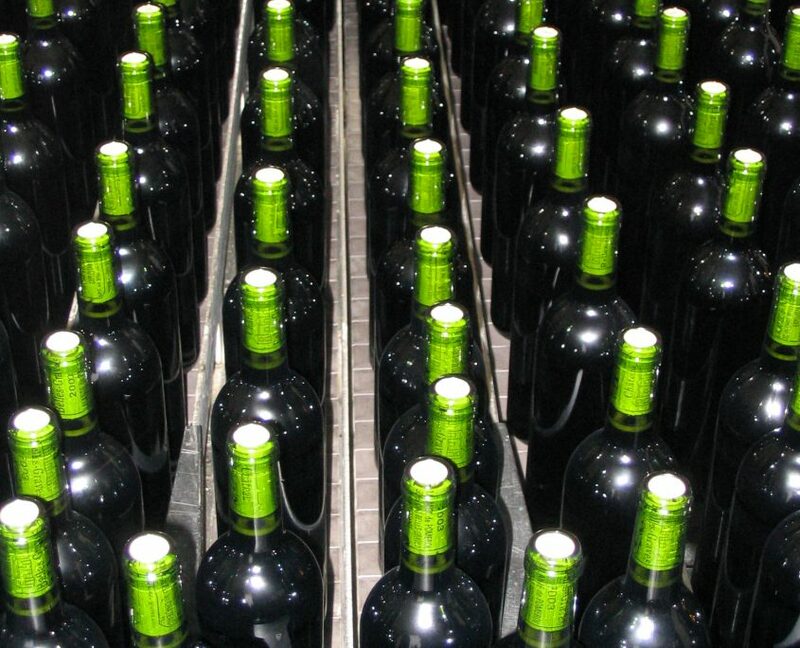 The process of racking takes place twice during the maturation, where the wine is separated from the deposit which has formed above the wine i.e. the lies. As well as this, a great deal of carbon dioxide is produced during the early stages of maturation, and this is removed during this process. Racking also allows, during the ageing process, for a small quantity of oxygen to be introduced with the wine, which improves the ageing. The topping-up of barrels is also very important, as this allows the replenishment of wine which has evaporated naturally from the wine, as well as preventing excess oxidation which could damage the wine. The process of adding a fining agent into the wine which is made from egg white is another important process. This enables to the wine to clarify and then to become biologically stable. The quantity of the egg white needed is determined by tasting. 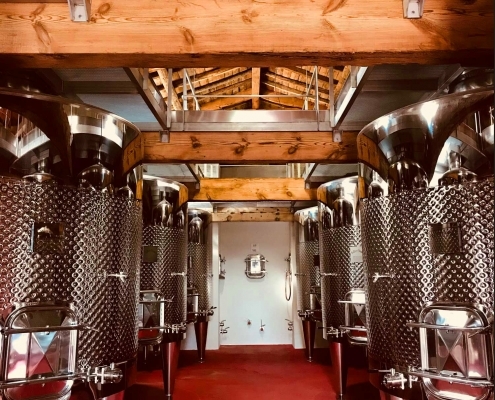 In 2018, the old original barrel cellar, in the west wing of the château, as been fully refurbished and turned into a brand new case for a high-tech winery. In this 18th century building, once a part of the roof totally undone, we entered 9 stainless steel vats, double-skinned for automatic thermoregulation, and equiped with most up-to-date technology. This new tool offers us outstanding wine-making conditions to go on creating our wines in the greatest respect of our family traditions and our unique terroir. 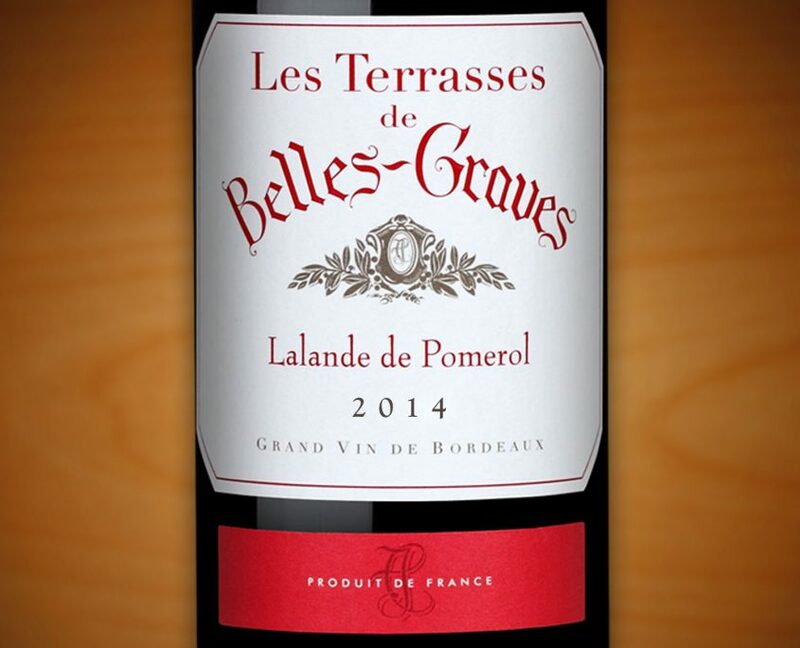 Having matured for between and 12 and 15 months, the tasting of each of the batches allows us to consider the blending of the wine – to create a first wine, Château Belles-Graves and a second, Terasses de Belles-Graves, which is lighter and created to be consumed when still relatively young. Once the blending has finished, the wine is ready to be bottled. This is the last oenological process, and it fixes irreversibly the state of the wine. For this process, we hire an assembly line which we place directly in the storage area. This allows to package our wines ourselves, to guarantee the quality. Vous ne payez aujourd’hui que la moitié de votre commande : le prix affiché sur la boutique correspond à un acompte de 50%. Vous règlerez le solde et les frais de port éventuels l’année prochaine, quelques jours avant l’expédition des vins, à l’automne 2020. Notre grand vin est produit par les vieilles vignes du domaine (âge moyen 40 ans), avec un assemblage de 88 % de cépage merlot, et 12 % de cépage cabernet franc. Il est élevé 12 mois en barriques de chêne. « Notes de fruits rouges mûrs (cassis) et épices douces (cannelle), bien charnu, d’une jolie intensité, aux tanins savoureux et puissants à la fois, d’excellente évolution » (Dussert-Gerber). 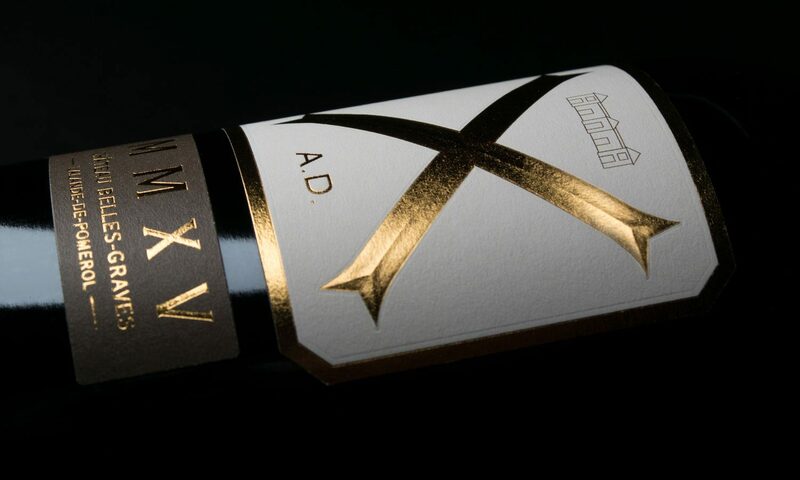 Ce beau millésime de terroir commence à révéler toute sa complexité, et propose une fidèle signature du domaine. A servir sur des viandes maturées, les sauces, le gibier ou les fromages. À servir sur des mets délicats et onctueux, pour magnifier toute sa finesse. Un filet de boeuf sauce Périgueux, ou plus simplement un gigot d’agneau de lait juste rôti. « Structure et finesse, souplesse et richesse, aux notes de fruits mûrs avec des nuances de sous-bois, ample et séveux » (Dussert-Gerber). Un millésime très classique que l’on peut commencer à déguster dès maintenant. « Nez profond, élégant, avec des notes fruitées qui gagnent en intensité à l’aération. La bouche est bien structurée dès l’attaque, les tanins sont présents mais polis et le fruit est bien relayé par la fraîcheur» (Gilbert et Gaillard). Ce vin bien équilibré commence à s’ouvrir, mais se développera encore avec le temps. Il confirme amplement tous les espoirs mis en lui, et s’il peut déjà s’apprécier avec gourmandise, je vous recommande tout de même quelques années pour lui laisser révéler tout son potentiel. Sans conteste un des grands vins de la décennie qui rappelle 2000, 2005 et 2009. Notre dernier millésime mis en bouteilles, en septembre dernier. Digne successeur du 2015, il présente un magnifique potentiel avec un parfait équilibre entre la finesse et la puissance, toute la splendeur des grands merlots. Il suffit d’un peu de patience, tout simplement. 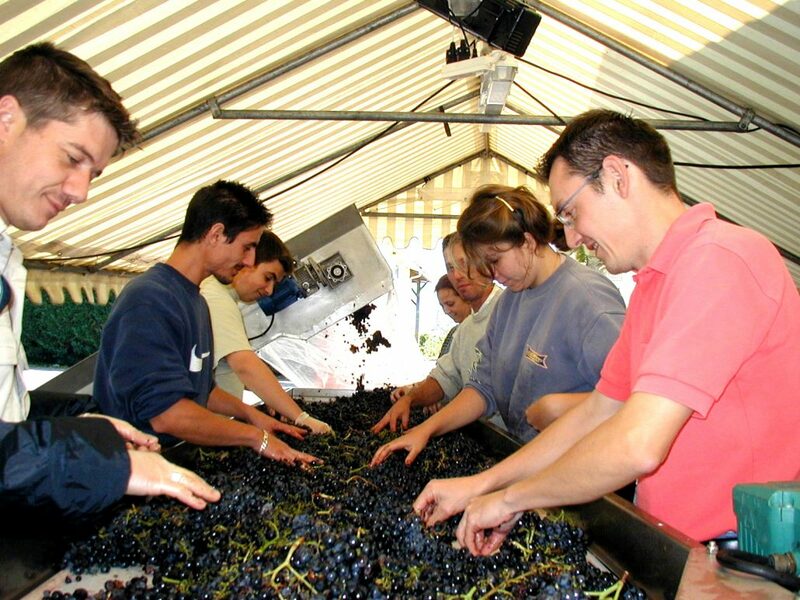 Ce second vin est issu de nos jeunes vignes, et travaillé pour privilégier la fraicheur du fruit. Il est élevé en cuve, et peut être dégusté dès maintenant. Il présente une belle palette aromatique de petits fruits rouges et noirs frais, associée à une structure fine et soyeuse.. Pour les grillades des beaux jours et les déjeuners en … terrasse ! L’effet millésime se fait aussi sentir dans cette cuvée, charnue et gourmande à la fois. La structure est bien présente mais en souplesse, il peut donc être servi sans attendre, et se marie avec une très large palette de mets variés. Le vin idéal d’un repas convivial. Cette nouvelle bouteille est un exercice de style qui présente ce que le domaine peut offrir de meilleur, dans le respect de notre tradition oenologique et de notre terroir d’exception. Un élevage particulièrement soigné en barriques neuves de chêne des plus nobles origines vient lui apporter l’encadrement raffiné qu’il mérite. VISIT OUR ONLINE STORE allowing you quickly and easily make your pick among the wines of our range and our offers in wine tourism. You can now create your account to receive information in preview and special offers. We will help you do if you like : you can call Monday through Friday at +33 (0) 557 510 961 from 9am to 12pm and 14pm to 18pm.